Early in this “After 20 Years” process, we were discussing (read: arguing about) updating the bathing room wall tile patterns. At first, some looked too modern to align with our design intent, but on second glance we agreed that they also appeared suitably classical. While standing in a bathtub, sketchbook in hand, artist-in-residence Chip Holton blurted out, “Charles Baudelaire said, ‘Modernity is the transient, the fleeting, the contingent; it is one half of art, the other being the eternal and imxmovable.’” (How does he remember this stuff?? I can’t remember what I had for breakfast!) That quotation summarized our discussion perfectly, speaking to the foundation of our intentions with the O.Henry: Blend classic, ageless materials and proportions with a touch of this era, and incorporate modern elements as technology requires. We’ve hit the ground (or rather, the ceilings) running with this effort. A number of years back, Chip painted ethereal sky views on the Magi suites’ ceilings. He’s now recruited two artist friends to help paint all of the sleeping room ceilings that way: These folks are fantastic! (I love that many people don’t notice the clouds when they first spend time in the room, but they inevitably smile when they sit down or lie down, look up and discover them.) We are still in the design process, but I promise that our guests will be delighted to find that their experience at O.Henry Hotel is even more enjoyable. Don Rives’s guidance 20 years ago created environments that are eminently comfortable, and we promise to build upon that legacy, not goof it up, as we make improvements to O.Henry Hotel (and also Green Valley Grill). Read more in our 2017 Fall Newsletter! During the first decades of this century, before the advent of super highways, the proliferation of airports, and the demise of travel by rail, hotels were locally-owned and so passionately managed that they became more than lodgings for travelers. 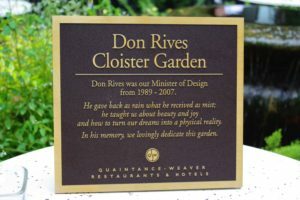 They served as a place where business leaders met, friends dined, and families celebrated joys of life. We used the vision of these community-centered hotels of old, that seemed indelible, as our design touchstone. In design, as well as function, the O. Henry reflects this grand earlier era – the comfortable elegance of the Arts and Crafts style, the use of classic North Carolina red brick, pine, and cast granite, and a meticulous attention to detail. These time-honored building traditions, when combined with the best modern technology, produce a hotel with the vitality to last more than a century. When guests arrive, they do not have to wonder about what to do or where to go next. Our business lobby is directly adjacent to the motor entrance. 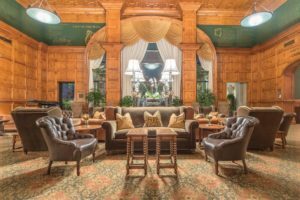 After walking across the carpeted entrance and passing through the revolving door, our guests are in an impressive room with paneled walls of honeyed pine, a honed limestone floor, antiques, and fresh flowers. They can immediately see the arched front desk, elevators, and the porter’s stand. Once their business at the front desk is finished, they can quickly pass across the business lobby to the elevators and on to their rooms. As with the great hotels at the beginning of this century, the social lobby is the heart of the O. Henry. It is a place where guests read morning newspapers, meet friends, take afternoon tea, and enjoy drinks before or after dinner. Guests find our social lobby both grand and irresistibly inviting. With its 25-foot high ceiling and 25-foot wide arched window looking onto our cloister garden, the social lobby’s custom-designed William Alan furniture and authentic British joint stools take us back to the 1920’s and 30’s – the era of Dorothy Parker and her favorite spot, the lobby of New York’s Algonquin Hotel. The grand piano and the custom Bose sound system fill this William Morris, early British Arts and Crafts inspired room, with the appropriate acoustic ambiance. Fashioned after an 18th century orangery (a garden building used to grow citrus), this sunny, enclosed, garden room is where our hotel guests are served breakfast, and where many can enjoy a catered luncheon or dinner. Opening onto the cloister garden, these two areas can be combined and used for a cocktail party and dinner. The Caldwell Room, named after a Greensboro forefather and esteemed educator, David Caldwell, is located on the lobby level. It is our largest banquet room, at 3,200 square feet when fully opened, and can be divided into six different combinations. It features four outside windows, plus a door that opens onto a wonderful courtyard garden area. The 4-inch thick sound-resistant walls are upholstered with a damask fabric that is pulled over batting for additional sound blockage. The Terrace Level Hawkins Brown Room, named for Charlotte Hawkins Brown, founder of the Palmer Memorial Institute in nearby Sedalia, is 1,500 square feet and can also be divided in various ways. There are doors that open onto an English walled garden. The Palmer Room, also located on the Terrace Level, is a gem of a room. Featuring paneled walls, it is an intimate dining or great meeting space for up to 16 folks. Regarding the Merchants and Manufacturers Room (M&M Room), Don Rives, our Minister of Design, was given this instruction: “Design a room that would be the ultimate place to entertain 12 of your favorite people.” And that’s what he did. The inspiration for this room is the wine-tasting room found adjacent to fine subterranean wine cellars. The room boasts a vaulted wooden ceiling, handmade floor tiles set between large heart-pine planks, a wall of enclosed wine racks, and herringbone masonry walls. It is furnished with a draw-table, high-backed leather chairs, an antique marble-top buffet, and tapestries. It is also where we hung the original oil study for the large Green Valley Grill mural. Our oversized guestrooms feature 9-foot ceilings, with cove moldings, allowing them to be luxuriously furnished and still feel spacious. Our windows even open! The rooms are separated by double walls for soundproofing. (We actually built two walls – the entire wall is one foot thick.) All four guestroom lamps offer three separate settings to give the broadest selection of light level and color temperature, and allows our guests to use an appropriate lighting level for business or pleasure, day and night. All of our guestroom furniture was designed by Don Rives to carry through an elegant, eclectic, residential style, and provide our guests with comfort and convenience. The honeyed-pine armoire houses the 46-inch wide-screen television, the microwave, the refrigerator, the ice bucket, and the glasses. The bed, more a piece of furniture than a bed, has an extraordinary look and feel. In fact, in the first 60 days that we were open, we had over 20 requests from our guests regarding the source of the beds so they could buy them for their own homes. Our bed linens include a seersucker blanket cover that is laundered daily – no unhygienic bedspread at the O. Henry. The camel back sofa is a sleeper sofa, featuring a mechanism and mattress with built-in springs on the foldout bed that are the best the industry offers. The full-sized, walnut desk was inspired by a William IV library table. In summary, the furnishings are designed to make our guests feel they are in a friend’s gracious home. Our glass-enclosed shower, with its Kohler showerhead, and custom Terrazzo receptor, is separate from a 5 1/2-foot long, 17-inch deep, cast iron soaking tub. Not only is the separation of tub and shower more comfortable, but this configuration eliminates the need for a shower curtain, which is always suspect when considering sanitation. The granite vanity with a porcelain sink and Moen faucets is 36 inches high for comfort while standing; whereas the separate granite vanity in the dressing room is 32 inches high, which is comfortable when using the dressing stool. The dressing room is a completely separate, private room that includes a built-in luggage rack, six open-front drawers, a closet with real hangers, and a safe for storing valuables. There are mirrors galore, including two that are full-length. 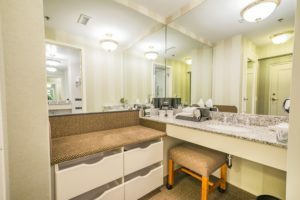 Free Wi-Fi, a Bluetooth connection-capable stereo system, a make-up mirror, a hairdryer, an iron and ironing board, a coffeemaker with gourmet coffee, real half-n-half, a variety of teas, soaps and shampoo are some of our in-room amenities. Our favorite amenity is the cushy bath rug. The complimentary bottled water and the high-quality stationery are often noted by our guests. We tested pillows for over a year. We tried at least ten that were custom-made for us by a wonderful company in Brooklyn, New York (recommended by our friend Bobbi Hoover at the Cocoon store on State Street in Greensboro). The pillows proved to be so popular with our guests that they are available for sale through Cocoon in our Sundries Shop. We were just determined to use that buzz word…but we use it, we promise, with purpose. We considered ergonomics when designing an adjustable desk chair that fits both the user and the desk. We actually had the chair and the desk built as prototypes and then re-designed them over a year’s time. Having a dataport in the phone and electrical outlets in the desk apron, allows for ease in making the connections to a laptop computer while seated at the desk. The pullout, adjustable TV can be angled for comfortable viewing from the desk chair, or while stretching out on the sofa or the bed. Both the desk and bedside phones have two lines. Each room has a private “direct dial” phone number and voicemail, and high speed Internet access is available. The TV includes over 100 free channels. Our guests can also review and settle their hotel accounts using the TV. A high-fidelity stereo system will play music from any Bluetooth capable device. We heat our water with the rejected heat from our air conditioning system. In fact, the technology employed in our heating, ventilation, and air conditioning system is indeed high tech. We use an energy exchange system that is designed to bring 50 cubic feet per minute of tempered outside air into each guestroom. The comfort advantage of bringing this outside air into each room is significant. Most hotels just bring some air in from the hallways. Yuck! Our thermostats are also very smart. They are equipped with door and motion sensors, as well as a complex algorithm, so that when a guest leaves the room, the temperature will float up or down a degree. That save a lot of energy without having a negative impact on our guest’s experience. We eliminated the biggest sanitation concerns that most people have with hotels. We don’t have the suspect shower curtain or the suspect bed spread. Instead, our glass-enclosed shower and separate tub offer superior sanitation. Our beds are topped with a blanket cover that is laundered daily. Our rooms are expertly cleaned and are sanitary. Near the windows on either end of our corridors, you will find guest writing desks with laptop computers and printers. Chilled or heated filtered water, an ice dispenser and “honor system” refrigerator with non-alcoholic beverages are centrally located in each hallway. It’s just different that we offer Afternoon Tea between 12:00 p.m. and 5:00 p.m. (Friday-Sunday), and between 2:00 p.m. and 5:00 p.m. (Monday-Thursday). Read more about our tea. After 5:00 p.m. every day, cocktails are served in our social lobby. Our guests merely ring a bell found adjacent to their comfortable chair or sofa, and our staff is at their service (yes, this was inspired by the Dorothy Parker stories from the Algonquin). The complimentary breakfast buffet served in our pavilion is wonderful in food and environment, if we do say so ourselves. Our guests enjoy a “good ol’ North Carolina breakfast” with homemade biscuits, sausage gravy, and creamy stone milled grits from the Old Mill of Guilford, or they might opt for lighter fare of delightful homemade breads, pastries, and assorted fruits — we have something for all tastes. Our staff is dedicated to provide the highest level service. Our primary focus is to ensure that all of our guests experience the highest quality accommodations at a good value. This is our promise.